As you probably know, I had gone to the Mahalaxmi Saras Exhibition at the MMRDA grounds in Mumbai's BKC, the day before. It is a fair dedicated to showcase produce primarily from Maharashtra, and a few other Indian states too. The current edition is on till 29th January 2018. I tasted a variety of Maharashtrian dishes there and was inspired by the many various flavours and textures on offer to come home and cook something based on them. I had shopped a bit too and my loot included a cast iron pan, made in Haryana, and the very Marathi Ghati Masala. I put my shopping to good use once I was back and this post is about a prawn dish that I cooked with the stuff I bought. 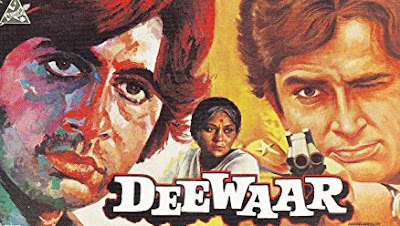 It is a sort of 'tribute to Mumbai dish'. 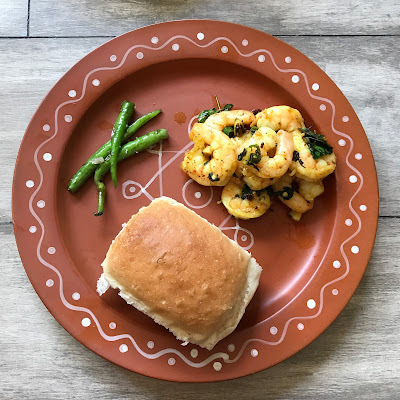 My recipe is inspired by the vada pav that seems to define the food of Mumbai for many, and of which I've been a fan of ever since I moved into the city two decades back. In a restaurant they would probably call this 'modern Maharashtrian'. 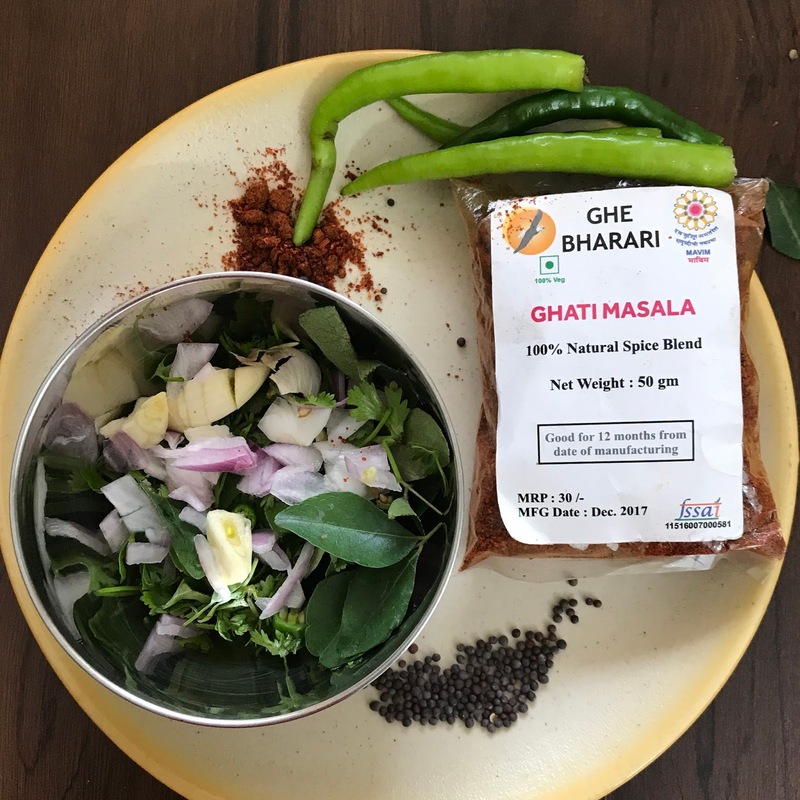 I used finely chopped green chillies, curry leaves, coriander leaves, fresh garlic, whole black mustard seeds, sea salt and onion to recreate what to me were the flavours of batata vada potato mash. I later checked on this with Mr Suryakant Sarjoshi who owns the Aaswad Restaurants. He told me that they do not add onions to the batata (potato) mix in batata vadas and that they add ginger too and just garlic. I added some Ghati Masala to my dish as this is normally sprinkled inside the bun when serving a vada pav. The prawns hardly took any time to cook and I'd add the dish to my repertoire of #CookingAfterALongDay recipes. Dishes cooked intuitively, and which hardly take any time to put together, and yet taste great and give us joy. I've been experimenting with prawns and with different spices and flavours of late. I call this exercise #prawnography, a word coined by my wife when I was discussing the concept with her. K and I both love prawns. 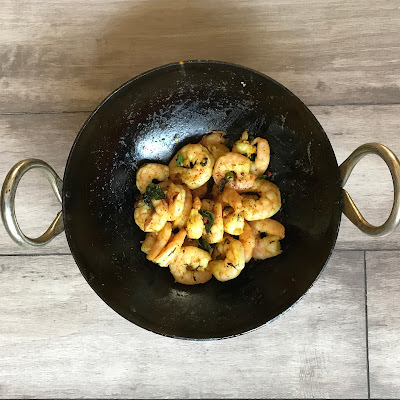 What I've realised over the last couple of weeks of cooking with prawns is that prawns offer a lovely canvas to play around with in the kitchen. Good quality prawns don't outshout the taste of spices and condiments added to them. Of course, for the combination to work, you should not add an excess of spices of overcook the prawns. If you do so, then the prawns would be lost in the crowd. To use a Hindi film metaphor, which is apt since this is a Mumbai inspired dish, you should be able to get the prawns and spices to come together in synergy the way the Late Yash Chopra did in movies such as Deewar with actors as different from each other as Amitabh Bachchan and the late Shashi Kapoor. It helped that no water came out of the prawns while cooking in this case. It is a problem if this happens as you then end up over cooking the prawns as you try to dry out the water. Have you ever experimented with flavours while cooking with prawns? Would love to hear about your inspirations if you have done so. 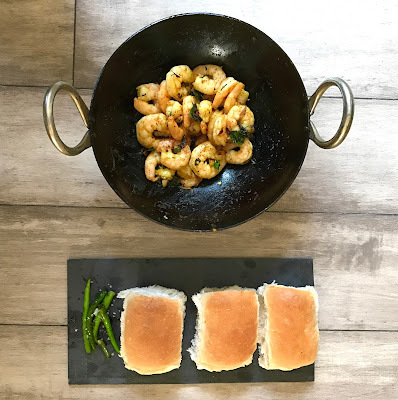 Here's the recipe for my vada pav inspired prawn dish. 400 g prawns. 300 g would do too for 2, but I used two packets of ITC Master Chef Frozen prawns which they had sent me to try. One is Jumbo and the other extra large and hence the difference in sizes. This weight after cleaning and deshelling. You would need more if otherwise. Each pack was 200 g net. I'd pair this dish with pav. Else sliced bread would do too as you can mop up the remaining oil with the bread at the end. Else rotis. Rice would be my last choice as this is a dry dish. Ghee bhaat perhaps. Chew on the salted fried green chillies while you have the vada prawns with pav. So this was our lunch on Republic Day. I had planned to cook with the cast iron wok that I had bought, the night previous to my attempting to cook the prawns. However, wasn't sure if I was seasoning it right as black stuff kept coming onto the paper tissues when I wiped the pan with them. I then called up chef Ashish Bhasin of the Trident BKC rather late at night for tips on what to do and as always, he came to the rescue. So here's what I did. I washed the pan with liquid soap and then dried it with a cloth and then put it on a high flame on a hob after coating the whole inner surface of the pan with vegetable oil. The oil began to smoke after a while and then I shut off the gas and then wiped the inner surface of the pan with a kitchen tissue papers. A lot of the black stuff came off. However, once I began to cook, some of it still coated the chillies and prawns. Ashish told me that's fine and a doctor friend of mine told that that is the iron and its fine if we ingest it as the body needs iron. I can't speak on this with authority though.